Smith.ai Live Chat is most useful to businesses seeking to boost online marketing ROI. Live, U.S.-based receptionists capture & screen web visitors, and help convert qualified leads into new clients. $8-12/chat. No contract or setup fee. 30-day/5-chat free trial. Smith.ai Live Website Chat is the fastest & friendliest way to capture, screen & convert website leads. Our U.S.-based professional receptionists (bilingual available) answer questions, qualify leads & schedule call-backs & appointments during business hours. Custom AI chatbots assist after-hours for 24/7 responsiveness. Mobile-optimized with custom display options, easy setup & instant chat transcripts, Smith.ai Chat is the most affordable & professional way to communicate with website leads. Smith.ai Live Website Chat Reviews Recently Reviewed! Pros: I love the Smith.ai website chat. There is no way that I could staff a feature like that in house with my small business. Smith.ai makes the chat feature available around the clock. 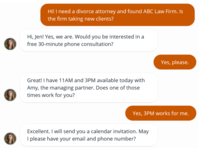 I am a lawyer and this feature is great for clients who are nervous or shy about making that initial phone call, or who are up thinking about the problem that they need help with outside of business hours. 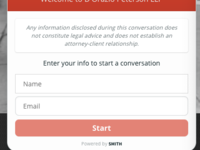 The Smith.ai Website Chat also integrates perfectly with my CRM/case management software. It has really been a boost to my business. I have tried other companies. Smith.ai is the best! Cons: Nothing. I love it! Wouldn't change a thing. Overall: I love the Smith.ai website chat. There is no way that I could staff a feature like that in house with my small business. Smith.ai makes the chat feature available around the clock. I am a lawyer and this feature is great for clients who are nervous or shy about making that initial phone call, or who are up thinking about the problem that they need help with outside of business hours. The Smith.ai Website Chat also integrates perfectly with my CRM/case management software. It has really been a boost to my business. I have tried other companies. Smith.ai is the best! Pros: Easy to deploy - Smith.ai provided a small code snippet to add to our page and we were live. Quality of responses - we already use Smith's Receptionist services, which gave me the comfort that the quality of people answering chats would be professional, consistently polite and knowledgeable. We get an email with the full text of the chat so we know everything that has been communicated by the prospective client already so we don't ask them the same questions over again. Cons: There is really nothing bad I can say about Smith Chat or Smith.ai as a company. We view them as a business partner and trust them to interact with clients and potential clients and represent us well, and they have never let us down. 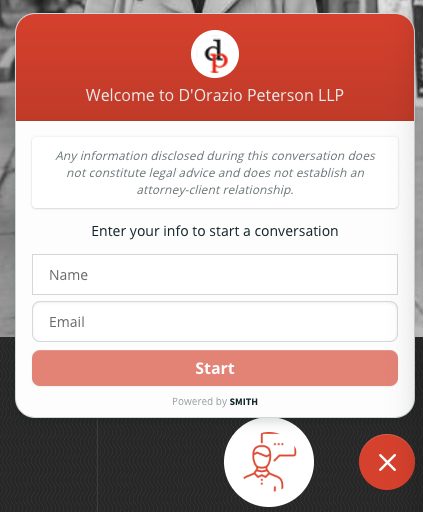 Overall: There are a lot of Chat options available, but this was a no brainer for us because of our great experience with Smith.ai as a company. Everything they do is focused on simplicity. Stuff just works. They make everything easy and have focused on hiring great people, which is evident by the way they treat us as a customer and the people that they chat with on our behalf. Pros: Ease of use. Ease of onboarding. I can manage my own chat disclaimer and everything from my dashboard. This is ALWAYS available to the clients/site visitors. Cons: How little potential clients actually use it! Overall: I love using Smith.ai. They do such a great job in following instructions on how I'd like my cases handled. I especially love the fact that I get email transcripts of all chats. I have never had incorrect information obtained (contact info) from any potential clients by Smith.ai. They are very detail oriented! Pros: We've worked with other vendors in the past and have found Smith.ai among the easiest to use. They're very responsive, they communicate well, and serve as our front lines for client communications. Cons: Nothing, we're generally pleased with the service overall. Overall: Smith allows us to converse with website visitors and turn them into potential clients. They've made it easier for use to be there at all times, even when we're not. Pros: I love that Smith's website chat uses real virtual reception staff during business hours so my clients get a personal touch from a real human some of the time. I also LOVE the ability to add and update questions and answers for the after-hours chat bot. It couldn't be easier to make this work. Cons: There could be a better communication about whether a real person is answering or the bot, I'm not sure potential clients know if they have a robot or a person. Overall: My experience has been extremely positive. I was an early beta tester and Smith is very responsive to all customer feedback. It was a learning experience for me also because you have to have realistic expectations about the amount of information you can expect virtual staff to know about your business. The more you program the Q & A for your account the happier you will be.